There are many species of lizards. 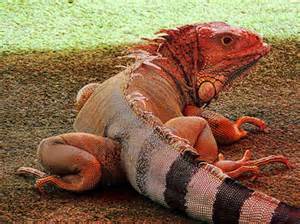 Some of the more popular domestically kept species include: Iguanas, bearded dragons, chameleons, and geckos. The specific behavior of lizards varies depending on the species. Some species, such as iguana, are active during the day, while others, like the leopard gecko, are active at night. Some species of lizards, such as the similarly sized bearded dragons, do well in groups, while others, such as chameleons, should be housed individually. Generally, lizards should be handled gently under the body and never caught or picked up by their tails (tails can break off). Some lizards (i.e. young iguanas) are quick and jumpy. 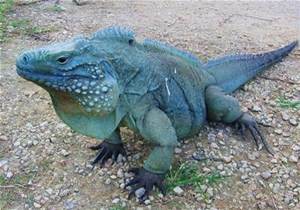 Older iguanas (which can reach several feet in length), can be aggressive and dangerous, whipping their tails and biting, especially when they reach sexual maturity. Other lizards, such as bearded dragons, tend to be gentler and more amenable to handling. Chameleons often resist handling. Regardless of the species, many lizards carry Salmonella bacteria; therefore, their feeding bowls and cages should be kept away from human food. Also, any surface they have contact with outside of their enclosures should be disinfected. Care should be taken to thoroughly wash hands after handling any lizard. 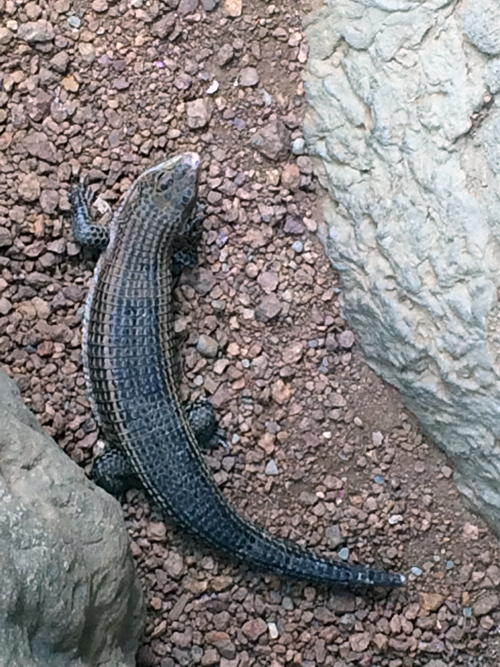 Some lizards, such as iguanas, are herbivores (plant eaters). 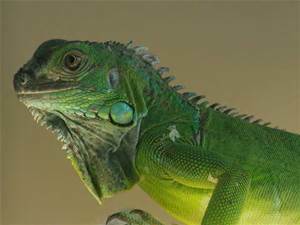 Iguanas may be fed calcium rich greens (i.e. collards, turnip and dandelion greens, romaine, spinach, kale, Swiss chard, cilantro, and escarole) daily. They also may be offered alfalfa hay and grass as well as lesser amounts of other vegetables (i.e. carrots, squash, pepper, broccoli, beans, peas, sprouts, okra) and occasional fruits (melon, plums, berries, bananas, apples, and kiwi). Other lizards, such as bearded dragons and chameleons, are omnivores (eat both plant and animal matter). 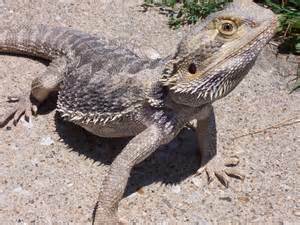 Bearded dragons may be fed crickets, mealworms, super worms, and wax worms, as well as pinkie mice. These food items should be dusted with a vitamin/mineral supplement containing calcium several times a week for young dragons and weekly for adult dragons. Dragons should also be fed greens similar to those described above for iguanas, smaller amounts of vegetables and even lesser amounts of fruit. Young, growing dragons eat insects daily with lesser amounts of greens and adults tend to consume more greens and fewer insects and are fed daily to every other day. 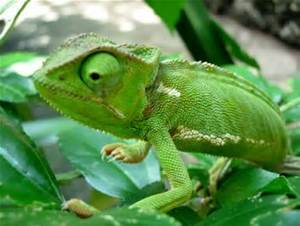 Chameleons primarily eat insects (similar to dragons) and also eat roaches, snails, and silkworms. 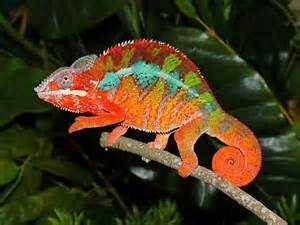 Insects can chew on chameleons and injure them; therefore, care should be taken not to give chameleons too many insects at any one time. Chopped greens, vegetables,and small amounts of fruit may also be offered. Young chameleons should be fed daily and adults should be fed 2 to 4 times a week. 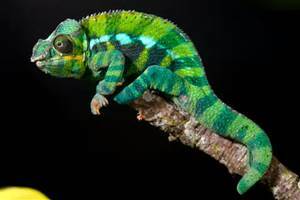 Chameleons should also be given supplemental calcium dusted on prey. 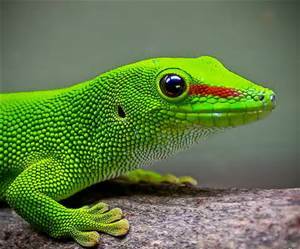 Other lizards, such as some geckos, are carnivores (meat eaters). Leopard geckos live mainly on insects dusted with calcium powder (every other day for adults). Young geckos are fed daily and adults are fed 2 to 3 times per week. Crickets should not be longer than the length of the gecko's head, and you should not feed more than 4 to 6 crickets per feeding. Specific housing requirements vary according to species. Smaller lizards, such as geckos, may be housed in well-ventilated aquariums protected by screens on top so that other predatory pets, such as cats and dogs, don't have access to them. Larger lizards, such as bearded dragons and iguanas, need enclosures at least 2' x 4' and should be high enough to enable climbing. Chameleons generally do better in wire enclosures with a minimum size of 2' x 2' x 3'. Acceptable substrates for the bottom of the tank may include newspaper, paper towels, recycled paper products, or rabbit pellets. Particulate matter bedding, such as soil, sand, corncob, gravel, walnut shells, wood shavings, and chips are not recommended, as they are indigestible, if eaten. All lizards should have a hide box, large rocks on which to rub off shedding skin, and open water bowls in which to bathe. Lizards also should be misted with water daily. 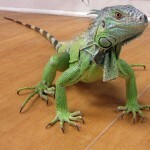 Iguanas require high environmental humidity and bearded dragons do better with a much lower moisture level. Chameleons will not drink standing water and require a drip system. both chameleons and iguanas require branches for climbing. All lizards require supplemental heat (over-the-tank bulb) so that a temperature gradient is established with a hot/basking zone (approximately 90 to 100 degrees F, depending on the species), and a cooler/shade zone (70 to 75 degrees F, depending on the species). "Hot rocks" are not recommended since they can cause burns. All lizards require 10 - 12 hours a day of exposure to ultraviolet light in the UV-B wavelength (UV bulbs must be changed every 6 months). All lizards should be examined initially after purchase and annually thereafter. They should receive a complete physical including examination of their feces for parasites. Every lizard should be de-wormed at least once. Review dietary and environmental requirements for your particular pet with your veterinarian. Please contact us (480) 893-0533 today to set up your pet's appointment with one of our excellent doctors.